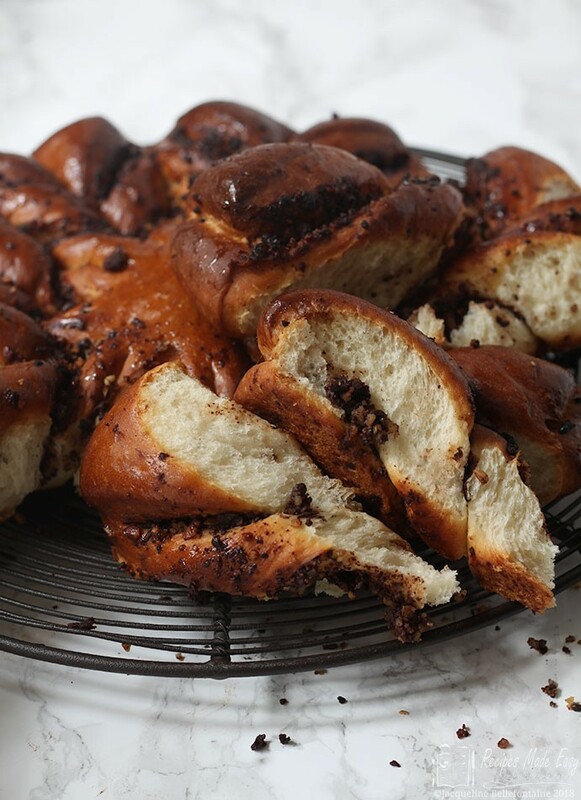 This week was bread week in the Bake Off tent and the contestants had to make a signature chocolate bread, dampfnudel ( I’d never heard of it either!) and a showstopper centre pieces using at least 3 different flours. Regular readers will know that I like making bread which may have something to do with the fact that my dad was a Master Baker, so I was really looking forward to this week. Once again I have given the show stopper a miss, but I have tackled two of the three challenges this week. 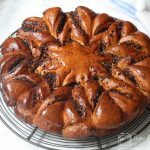 Chocolate, Pecan and Orange bread is my take on the chocolate bread with a twist. I have baked bread in a tent with Paul Hollywood. I even got the Paul Hollywood seal of approval for my loaf and no, I wasn’t a Bake off contestant. It was a few years ago. Pre Bake Off in fact, so Paul had yet to achieve the fame he now has. He was just starting to become known, so I had no idea what it would come to mean to have the Paul Hollywood seal of approval for my bread making skills. But even then I was really struck by his depth of knowledge. I walked away that day with one particularly valuable tip that really improved my home baking. That was to make my bread dough a little wetter. A common mistake with home baking. When you first start to knead the bread the dough should be a little sticky. 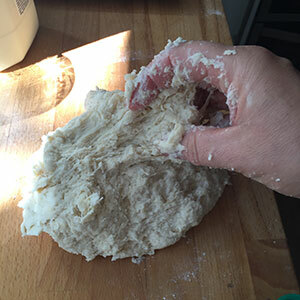 The process of kneading the dough helps the gluten develop and the stickiness will go. My recipe for chocolate, pecan and orange bread is based on a recipe I originally wrote for Baked and Delicious Magazine which was a walnut and cinnamon bread. 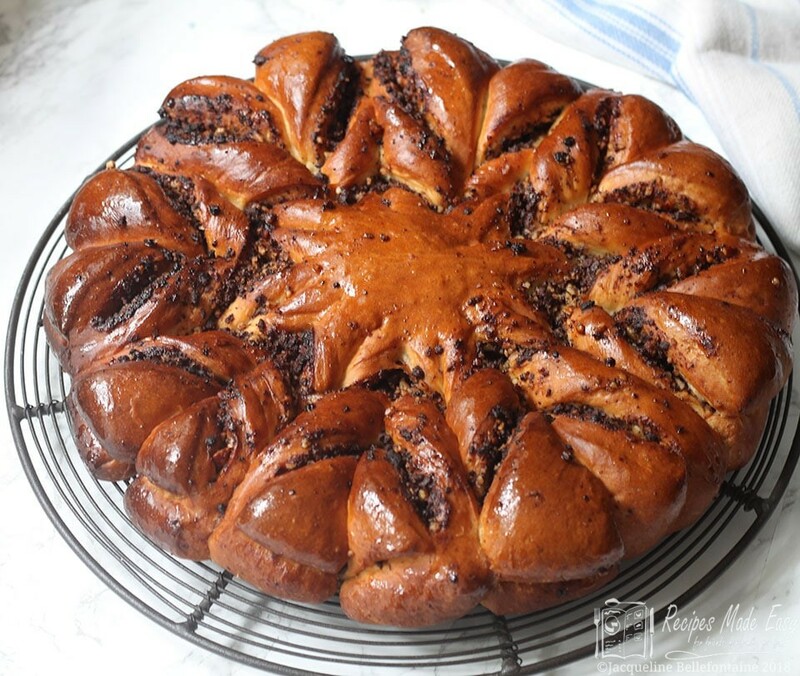 It’s a pretty tear and share bread, which is easier to shape than it might look. To fit the Bake Off brief I have substituted the walnut and cinnamon filling with a filling made of chocolate, pecans and orange zest. I love the result, I hope you do too. To make the dough, place the flour into a mixing bowl and stir in the yeast, sugar and salt. Rub in the butter. Add the milk and enough water to mix to a soft slightly sticky dough. Turn out the dough and knead well for 5 minutes, until smooth and elastic. Return to the bowl, cover and leave in a warm place to rise for about 1 hour or until doubled in size. Meanwhile prepare the filling. Finely chop the pecans in a food processor, then tip into a mixing bowl. Next finely chop the chocolate in the processor and add to the bowl. Stir in the sugar and orange zest. Set aside until required. When the dough has risen, knock back the dough and cut into two equal pieces. Form each piece into a ball, then roll each piece out to form a 28cm circle. Place one of the dough circles onto a lightly greased baking sheet. Brush the surface of the dough with Sprinkle the filling evenly over the surface of the dough, leaving a 1cm border around the edge.Cover with the second circle of dough and gently press the edges together. Use a small glass or cookie cutter to mark a circle in the centre of the dough, then cut the dough into 16 equal sections. Taking one section of the dough, lift and gently twist twice in one direction. Then take the next section and twist in the other direction. Continue twisting the dough sections in alternate directions until all the pieces have been twisted. Cover loosely, leave in a warm place to rise for 30 minutes. Preheat the oven to 190°C/170°c fan/gas mark 5. Bake for 30–35 minutes, until golden brown. The bread should sound hollow when tapped on the bottom. Brush with maple syrup whilst the bread is still warm. The bread is best eaten on the day it is made. 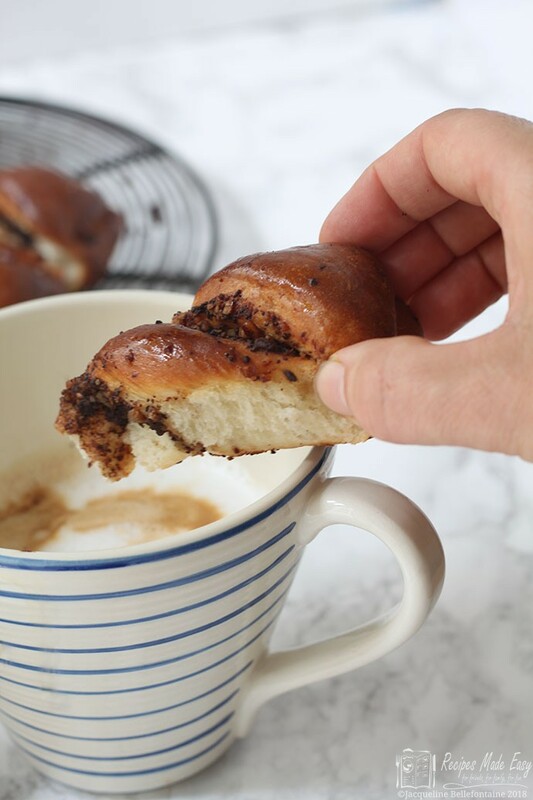 Make a soft, slightly sticky dough. Knead well. Note how the stickiness has now gone. Roll out half the dough to a large circle and brush with egg white. Sprinkle the filling over the dough leaving a boarder around the edge. Cover with the another circle of dough. Mark a small circle in the centre of the dough and cut into 16 equal portions. Take one section and twist in one direction. Then take the section next to it and twist in the other direction. Continue until you have twisted all the sections. Leave to rise and then bake. Can I just say it is delicious dunked in coffee. I wonder if Mary would disapprove. Because I like yeast cookery, and because I had never heard of it before, I decided I would give the recipe for the technical challenge a whirl as well. Making the dough is fairly straight forward. Having said that it was the first yeast dough I have made without salt, so I was a little apprehensive. Salt helps regulate the yeast and I also think it is needed for flavour. Judging when the dough balls are cooked was a little tricky and I ended up re-covering the pan and cooking for another 5 minutes. Getting them cooked and risen in the two hours they were allowed for the task was also tricky. I think mine took about 2 1/4 to 2 1/2 hours. They tasted ok, and got the seal of approval from my German friend, but I think they would have been so much nicer if baked. If you fancy giving them a try Paul’s recipe is here. Word of warning: remove them from the pan before they get cold or you will end up with dampfnudel well and truly stuck to the base of the pan. Don’t forget to pop over and check out what Jenny at Mummys Mishaps and all the other bloggers have been baking for the Great Bloggers Bake Off. PS. I won Star Baker last week for my Iced Sweetheart Biscuits in the Bloggers Bake Off. Oh my word, this looks AND sounds amazing! Could just eat a piece right now! I love the flavour combinations and what a great tip to keep the dough a little wetter when kneading as adding in extra flour is something I am certainly guilty of! Thank you Caroline. I think we have all been guilty of making our dough a little too dry at sometime or another. Love that shape! It is really effective and always makes me think of Nutella, I think from GBBO a couple of series ago. I love everything with pecan nuts and I think combining them with bread and chocolate sounds divine. 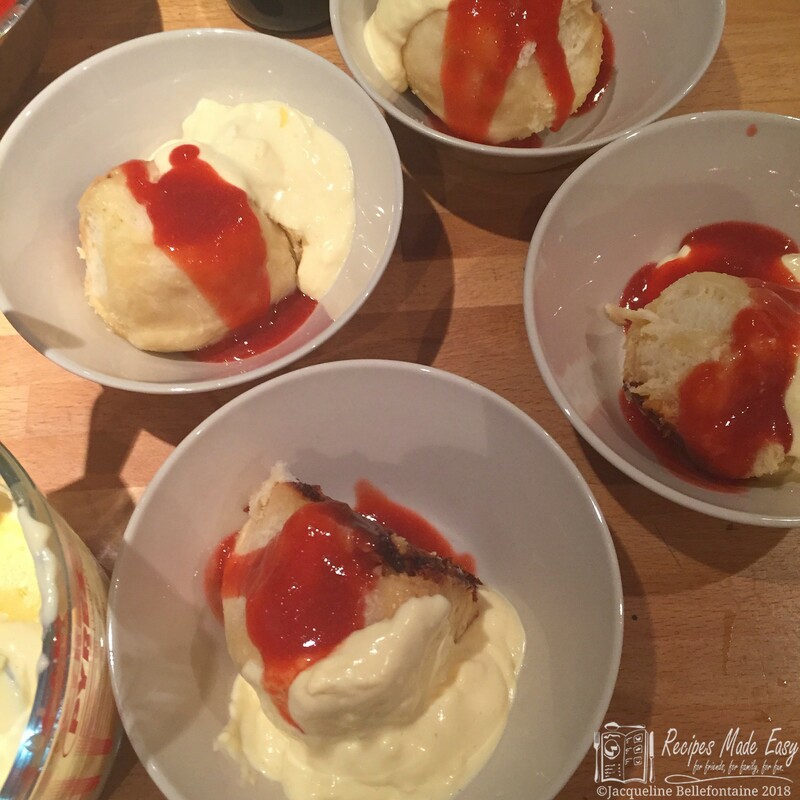 Well done for making the dampfnudeln too! Pecans are my favourite nuts closely followed by hazel nuts so I do tend to use them quite a lot. The pecan and orange bread looks fab. I would like to try the Dampfnudel, but I didn’t have time to try them now, as I’m away. Yours are great and getting them off the pan is a very good idea, I’ll keep it in mind. Thank you Anca. Its always fun to try something new. If i were to make them again i think I would add some salt next time. Your bread not only sounds delicous in terms of its flavour, but it is so pretty to look at and such a wonderful colour. I bet it was lovely dipped into coffee. And fancy having met Paul before he became famous bet he still had that twinkle in those blue eyes though! Great that he gave you such a fabulous and useful tip for making bread. Your Dampfnudel looks nice – it is a strange sounding recipe indeed, it probably tastes nice enough but not sure i have the inclination for the faffing around! Yes uit probabaly is why your bread is a bit heavy. Funny that it took Paul to advise me on this, Even though my dad was a baker but that was because I dont think he ever saw me make bread! Your loaf looks absolutely stunning! I bet it tasted wonderful too. I agree with you about the Dampfnudeln… i think I would have preferred them baked. Yes he certainly knows his stuff. oh my! I am totally in awe of your jaw dropping baking – looks amazing! And what talent you have to do those clever twists. Just wow! Looks like a piece of art! Thank you that’s very kind. It is much simpler than it looks though.